Alliant’s story is about more than improving board collaboration, it’s the story of how one credit union has leveraged board meeting technology to securely compete and thrive in the information era. 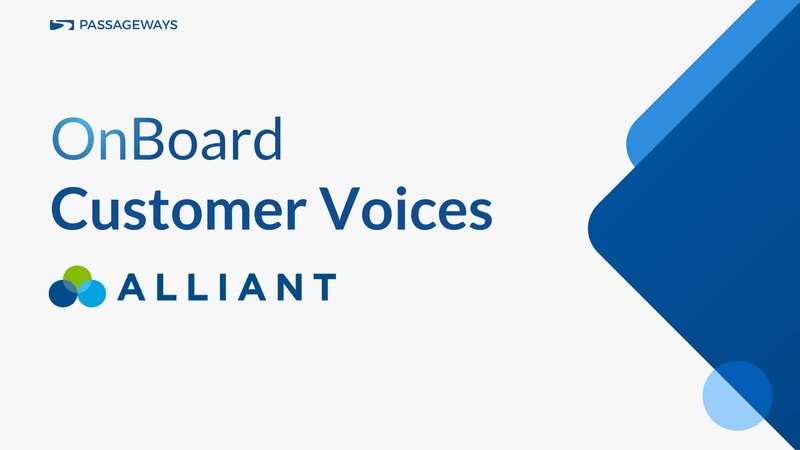 Nearly a decade ago Alliant adopted the first edition of Passageways board technology for their board and committee meetings, shifting cold turkey to a fully digital board experience. “For years we had produced these very large paper packets for our board meetings. There would be a tremendous amount of information gathering, editing, assembling, and then shipping to our board,” recalled David Mooney, the President and CEO of Alliant. “We in management recognized that there was a more efficient way to go, and that was to go digital.” Alliant quickly adopted Passageways next generation board portal, OnBoard, shortly after release. Alliant Credit Union was founded in 1939 to serve United Airlines employees and their family members. Today, the Chicago Credit Union is among the largest in the country, boasting $10 billion in assets with a diversified set of sponsor organizations including Google and Keizer Permanente. Proudly a digital-first credit union, their eleven-member board has long been dedicated to delivering value to their members by integrating technology into every aspect of their credit union. “We were dealing with a group of board members who were highly engaged and highly committed outside of Alliant, executives at their own companies, and we needed to get them information in real-time, quickly, that they could use anywhere, just not during our meetings, but before and after our meetings,” added Lee Schafer, Senior Vice President of Corporate Affairs and Chief Administrative Officer. Providing anytime, anywhere, digital access to board materials was central to a larger strategic shift occurring at Alliant Credit Union. That meant managing governance through expanded committee work. By collaborating across teams, time zones, and continents with OnBoard, their board can arrive at more deeply considered decisions. All of the work that’s done by the committees, the reports they are receiving, the consultant activity that’s going on that’s posted to OnBoard – all of that becomes visible to every board member. Because with OnBoard you’re putting the board book together section by section, it's made the process so much easier. It used to take me all day to do the board packet, and now I can do it in an hour,”' she said. That ease of use directly translates to significant time savings for Alliant’s executive administrator Amy Adams, “The central pain point that is relieved for me is time. It used to take me hours to convert everything to a PDF. If you found one small error you are basically had to start from scratch a new board book. Because with OnBoard you’re putting the board book together section by section, it's made the process so much easier. It used to take me all day to do the board packet, and now I can do it in an hour,” she said. OnBoard provides robust flexibility for Alliant's busy directors to govern from anywhere. Alliant now conducts numerous meetings completely remotely. Mr. Mooney recalled that just days ago "I happened to be traveling when our talent and compensation management meeting was held the other day and I was able to access remotely and participate in the meeting as if I was on site." No matter where their board members are at or what device they are on, OnBoard provides the tools Alliant needs for continued success, “It’s a great repository of information. We house on OnBoard our reference information, everything from bylaws to directories to our ethics policies, so it’s a great central source and very efficient central source that doesn’t take up draws of file cabinets or require shredding,” Mr. Mooney concluded. "I find myself, personally, often going back and referring to previous board packets that contain information I want to see, for comparison purposes, or to jog my memory." "I happened to be traveling when our talent and compensation management meeting was held the other day and I was able to access remotely and participate in the meeting as if I was on site."